In the realm of restorative dentistry, dental implants are king. A dental implant can replace a tooth with a permanent, life-like restoration with a solid reputation for durability. Implants are also known for one other quality — variety. Not all implants are alike, and they have varied applications for use. Available in various shapes and sizes, they can be used for a single tooth or as part of a multiple tooth bridge or overdenture. And while their basic architecture is the same, you also have two options for how the permanent crown (the visible tooth portion) attaches to the implant: screwed or cemented. A screw attachment can securely fasten a crown to an implant without the need for cement; it also allows for easy removal for repair or replacement should the crown become damaged or worn. On the other hand, it could pose a cosmetic problem — even though the access hole for the screw may be covered with a tooth-colored filling, it could still be distinguishable from the rest of the crown. There’s also a slight risk of the crown chipping around the access hole. A crown cemented to the implant won’t have this cosmetic issue with an access hole, and will look just like a natural tooth. 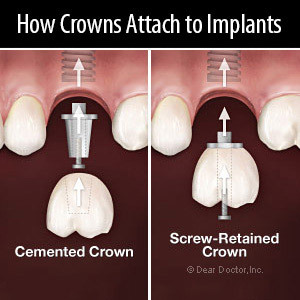 But unlike a screwed crown, removing a cemented crown can be more difficult. The cement may also cause gum inflammation and potential bone loss in sensitive patients. The condition of your mouth, the type of implant you’re receiving and other circumstances will all factor into determining which method is best for you. If we’re “immediately loading” the crown (meaning we’re affixing a temporary crown to the implant immediately after placement in the jaw), then the screw method may be more advantageous. Aesthetically speaking, though, a cemented crown may be a better option in terms of final smile appearance. But whichever method is used, you’ll still benefit from what implants do best — help you regain the function lost from a missing tooth and change your smile for the better.